During it’s 10-year history, three men held the post of Commissioner in the American Football League. 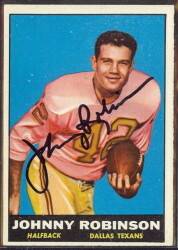 Joe Foss, World War II fighter pilot and former South Dakota Governor, was the AFL’s initial commissioner and helped get the league off the ground. 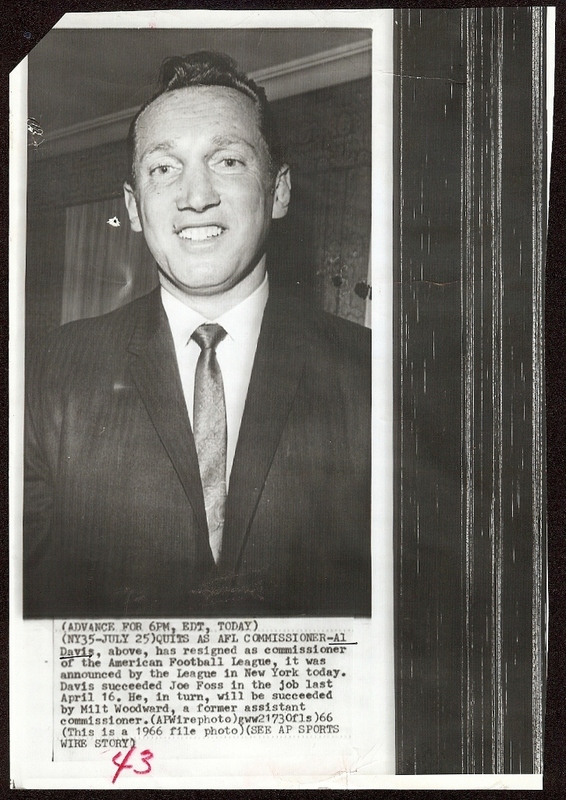 Legendary Oakland Raiders head man, Al Davis, held a brief three-month stint in the AFL’s top office. 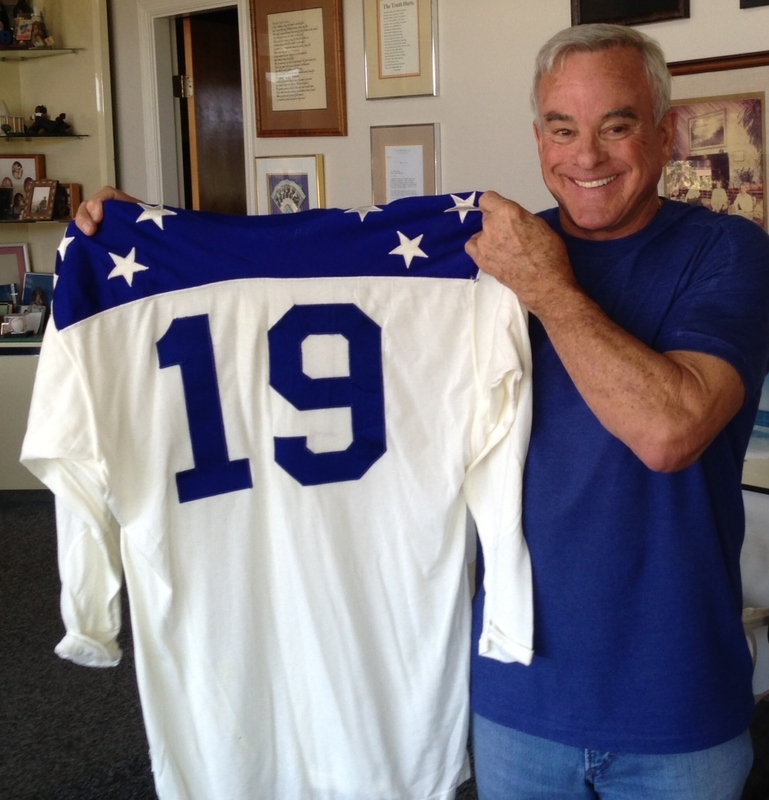 During that time, in response to the NFL’s New York Giants signing kicker Pete Gogolak away from the AFL’s Buffalo Bills, Davis led a frontal attack on the NFL, and helped lead to the eventual merger of the leagues. 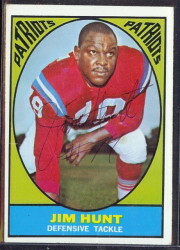 Milt Woodard guided the AFL through it’s final four seasons and into the merger with the NFL. 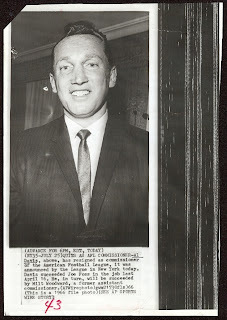 in the years post-merger, Pete Rozelle maintained his position as Commissioner of the NFL, and therefore watched over the National Football Conference (former NFL teams) and American Football Conference (former AFL teams, with the addition of the Baltimore Colts, Cleveland Browns and Pittsburgh Steelers). Wire service photos are an interesting collectible in that they represent a particular point in time and were a useful tool for use by the media. Recently a handful of large wire service photo collections have come up for sale on ebay. Literally hundreds of thousands of these photos, which cover every imaginable subject, have become available to collectors of all sorts. 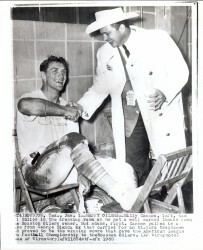 The following photos mark the changes in AFL Commissioners through the 1960s. The text below each image is the caption that the wire service used to describe each photo. 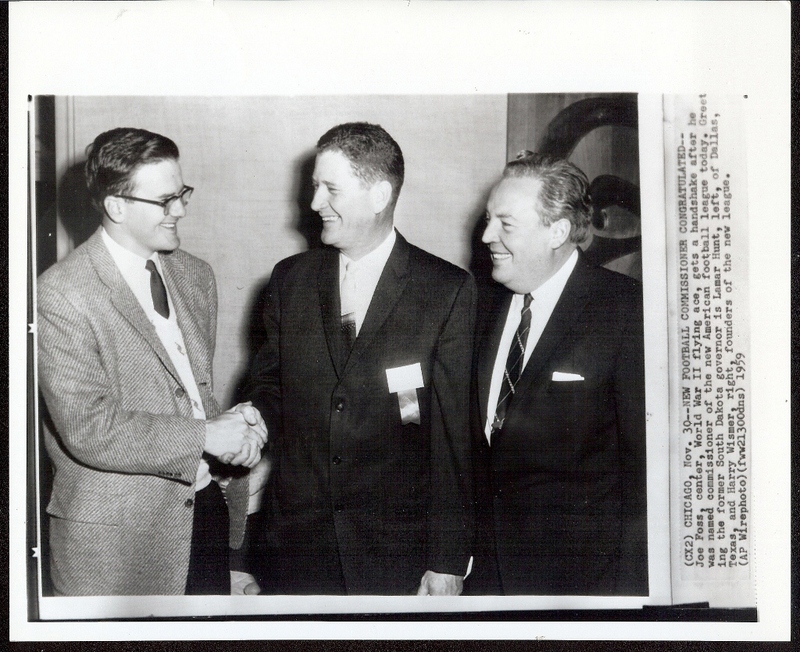 November 30, 1959 – Joe Foss, center, World War II flying ace, gets a handshake after he was named commissioner of the new American Football League today. Greeting the former South Dakota governor is Lamar Hunt, left, of Dallas, Texas, and Harry Wismer, right, founders of the new league. 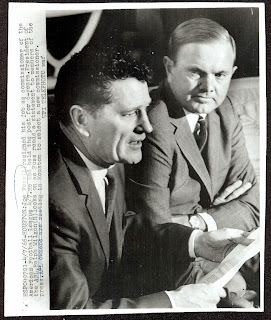 April 7, 1966 – Joe Foss resigned his job as commissioner of the American Football League 4/7. He had held the post for 6-years. President of the AFL, Ralph Wilson (R) looks on as Foss reads a statement to members of the press. AFL owners are meeting in Houston to select a new commissioner. 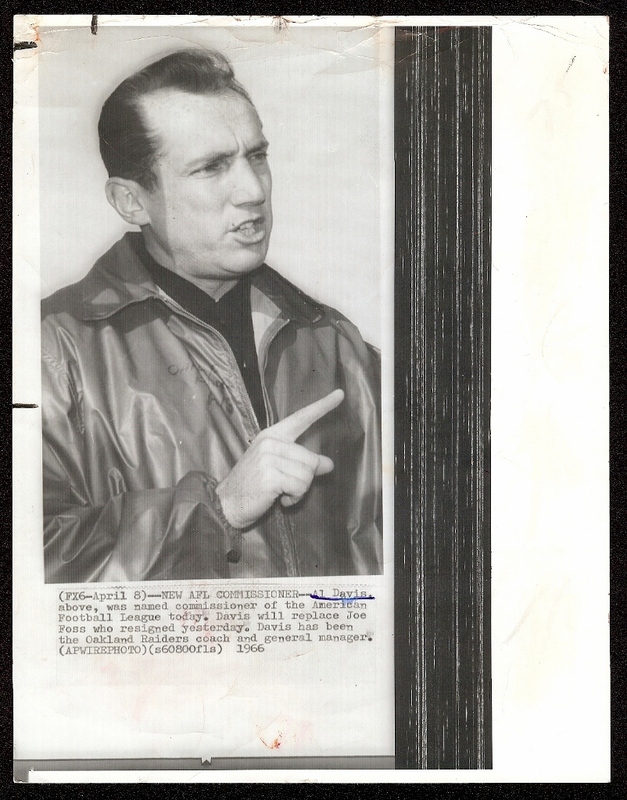 April 8, 1966 – NEW AFL COMMISSIONER – Al Davis, above,was named commissioner of the American Football League today. Davis will replace Joe Foss who resigned yesterday. 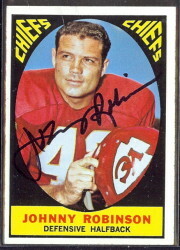 Davis has been the Oakland Raiders coach and general manager. July 25, 1966 – QUITS AS AFL COMMISSIONER – Al Davis, above, resigned as commissioner of the American Football League, it was announced by the League in New York today. Davis succeeded Joe Foss in the job last April 16. He, in turn, will be succeeded by Milt Woodard, a former assistant commissioner. 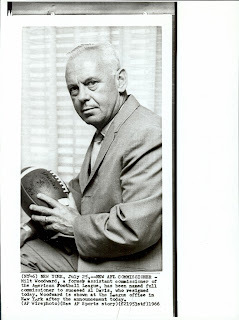 July 25, 1966 – NEW AFL COMMISSIONER – Milt Woodard, a former assistant commissioner of the American Football League, has been named full commissioner to succeed Al Davis, who resigned today. Woodard is shown at the League office in New York after the announcement today.